About half a dozen protesters heckled former British Prime Minister Tony Blair today at a commencement ceremony at Colby College. 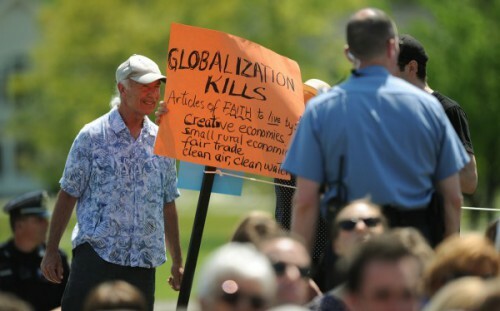 A protester stands with Jody Spear, obscured, of Brooksville, a Colby College alumnus, as she holds a sign to protest former British Prime Minister Tony Blair’s presence during commencement on Sunday, May 20, 2012. Far left loons heckled Tony Blair today at Maine’s Colby College graduation. A handful of protesters briefly interrupted a Maine college graduation speech by British Prime Minister Tony Blair calling for world unity. Blair addressed more than 400 Colby College graduates and their guests Sunday morning at the school’s 191st commencement in Waterville. Police say the protesters shouted phrases such as “warmonger” and “war criminal” during Blair’s speech. One person was arrested. In his address, Blair appealed for international cooperation and for people to try to understand other cultures. Of course, these same loons give Barack Obama a complete pass for drone bombings in Pakistan.